Review by Belgian Gentleman on 1/5/2017. I like how the map plays as a mirror. Both sides are parallel to each other. 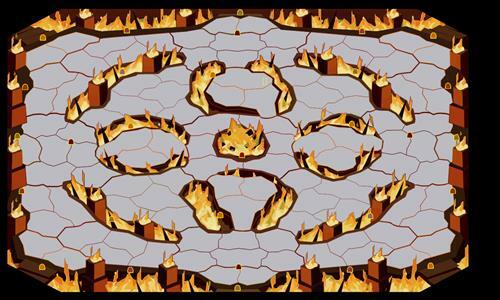 Add a 1v1 scenario starting on Hiuturan and Geany and this map would've been complete. yea sure,i might as well add other scenario too ,thanks! Review by Lionheart on 1/4/2017. Amazing map, with visual apealing and fantastic gameplay. the power of the dark side is strong with this one..
Review by RobGodkin on 1/4/2017. This map reminds me of the stone gladiator arena on Chivalry. What more can be said then what already has been, ... Burn Baby Burn, or Let It Burn. Sounds good, I'll leave it at that. Review by Captain Ercoupe on 2/5/2017. Review by A_B3 on 11/16/2017. Very balanced. Small enough to make for a reasonably quick game. Review by warhawk on 1/8/2018. Linear balanced map. All connections good. Review by Bart Jansen on 2/15/2019. Review by No One on 3/31/2019.